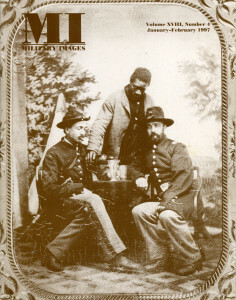 A sixth-plate tintype from the Coby Mack Collection pictures three Yank tipplers at the officers’ mess enjoying a break from endless rounds of drill. The editor notes work on the Irish Brigade monument at Antietam, Ron Tunison’s medallion bust of Gen. Meagher and new mailing software. Five publications are mentioned, including American Civil War Confederate Army (Brassey’s Inc.) by Ron Field, Bentonville: The Final Battle of Sherman and Johnston (University of North Carolina Press) by Nathaniel Cheairs Hughes, Jr., The Alabama and the Kearsarge: The Sailor’s Civil War (University of North Carolina Press) by William Marvel, Photographer Under Fire: The Story of George S. Cook (Historical Resources Press) by Jack C. Ramsay, Jr. and Civil War Firearms (Combined Books) by Joseph G. Bilby. A brief history of the militia company that became a regiment that mustered into federal service during the Civil War as the 19th Pennsylvania Infantry is illustrated with portraits of John T. Durang before and during the war. He was seriously wounded at Gettysburg. The author relates his experience on the research trail, hunting for information about a soldier identified in a portrait photograph as Charles B. Mitchell. A survey of 20 portraits from the collections of our readers highlights the wide variety of Zouave-inspired fashions worn by soldiers as late as 1910. In “8th Regiment, Massachusetts Volunteer Militia,” McAfee explores the history and uniforms of this hybrid Zouave regiment. The text is illustrated with a portrait of an enlisted man from the regiment. A description of how Stevens won the competition is also a lesson in drills of the antebellum period. Stevens went on to fight in the Civil War with the 2nd Wisconsin Infantry and suffered a mortal wound in the fighting at McPherson’s Woods at Gettysburg. The story of “Augie” Corliss spans from 1861 to 1904 and includes numerous anecdotes and life details. The text is illustrated with ten photographs and artworks of Corliss, and images of his cap, coat, revolver and a post-Civil War badge. A well-known portrait of Benjamin Franklin of the 2nd Minnesota Cavalry illustrates a story of how he came to lose his legs to frostbite. Also included is an image of Franklin before he lost his legs. The Captain tries to pull a fast one over readers with an almost genuine Zouave image. Solo photos of the odd and unusual from the collections of our readers includes nine Confederate portraits. A sixth-plate tintype from the Michael Albanese Collection pictures a soldier posing with a mug, an apple on a tin plate, and an unknown morsel on the end of his fork.